The first $50 "60 REPORTS" Flyer is the one I use. Because: I am able to print the customers' name & Address on all 66 Flyers. Because: They can not print the customer's name & address on all 66 Flyers. Dealers can sell this Dealership for 60 All-Profit Ads for $50 using the 2nd Flyer. that the customer must rubber stamp their name or paste name & address strips in them. that includes a 50% Dealership. This is another dealership. That is a total of 612 Dealerships in this one Exciting Mail Order Dealership. Because: They can not print the customer's name & address on the Flyers. You are able to sell this Dealership of 60 All-Profit Ads and reports for $40 using the $40 Flyer. but the customer must rubber stamp their name or paste their name & address strips in them. that includes a 50% Dealership. This is your opportunity to offer the 50 name & address Strips Dealerships for $4.00 + 2 stamps. customer has to rubber stamp their name or use name & address strips in everything. Because: They Don't have to print the customer's name & address on the master Flyer. You are able to sell this Dealership of 60 REPORTS for $35 using the $35 - Flyer. The customer must rubber stamp or paste their name & address in the flyer. 60 Report Flyers, or 50 free name & address Strips that includes a 50% Dealership. and no custom Flyers for the Reports with this Dealership at this price. add the 50 assorted name & address Strips Flyer and 60 All-Profit Ads Flyer. This is still a Great Add-On To Any Mail Order Business because these Reports are all 1-5 page reports. 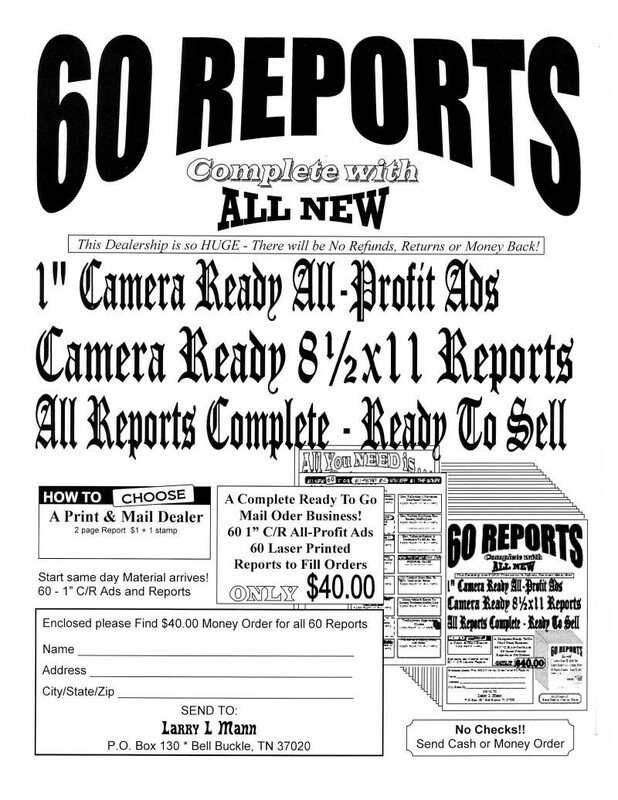 The "Another Complete Mail Order Business"
is Included in the $50 - "60 Reports" Dealership. separately for $5.00 plus 3 f/c stamps. and you can create any number of Dealerships you like. Below is a Brand New Custom made Flyer! The Flyers above are Dealerships with Dealerships that Include 1" C/R All-Profit Ads. That means you are going to need "Name & Address Strips" to paste in the flyers and 1" Ads. This Flyer offers the dealer 1 - 50% Dealership.